The surgeon’s waved the green flag. One more visit to the specialist awaits. Lungs seem to be expanding and contracting in the way they should, bar a little percussive rattliness here and there. In any case, they’re functioning well enough for me to take advantage of the British Airways sale and book a flight back to the Americas. My plan is to return to Ecuador to pick up where I left off. Despite my unhurried progress on my original journey south, plenty of stones were left unturned. I’ll be making the most of the journey back (and saving some cash in the process) by flying via Denver, Colorado, in the first week of October. I’m allowing some time to plug a gap in the Great Divide Mountain Bike route I tackled in 2009 – Steamboat Springs to Grants NM – before I was forced off course by by a little snow… Although I’m earlier in the year this time, I’m not as early as I’d hoped. October in Colorado can be a time of pristine skies and fall colours, or the unleashing of the first of its winter storms. We shall see which I’m lucky enough to get. With two weeks to go by departure, I’m simplifying again: whittling down kit and prepping my bike. It’s all too easy to to accumulate, even after just a few months in a fixed abode. Living out of just a few panniers again will feel good. I’m also doing my best to claw some of my lost fitness. Last Saturday, it was a ride in the beautiful Black Mountains, Wales. 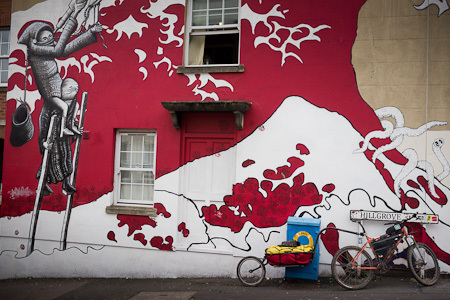 Tuesday, a tour around Banksy’s Bristol with the Bicycle Festival. Yesterday evening, a singletrack night loop of my local woodland trails, Ashton Court. A day ride to Clevedon’s Victorian pier awaits on Sunday. My training ground. Not quite like the Rockies or the Andes. The Troll, Mule and a mural in Stockes Croft, Bristol. Since you’ll be in Denver, why don’t you ping me. I may be able to offer some help (getting you off the airport, assembling the bike etc…). This is great news, Cass. Best wishes for hitting the (dirt) road. Look forward to your further travels Cass. We’re embarking on our own adventure soon… a year of travels via plane, train and automobile (and an occasional leg by bike, who knows?). Glad you’re in travel form once again. Cass, I caught up with Jay Petervary yesterday in Jackson, WY. He said that someday he hopes to do some “casual” bike trippin. Kind of funny considering what he’s been up to this past year (17 day on the Divide, for example). Anyway, I’m casually travelling the Divide, but have sidetracked recently as Lael has joined me for a few weeks. She has a flight out of Denver in just over a week, at which time I hope to jump back on the route, barring any snowy obstacles. I’ll cook you gritty coffee and hot lentils if you want a riding partner. Nick, I saw you were headed to Denver soon and meant to drop you a line. I’ll email you. Yay! for the clean bill of health. Looking forward to your next entries. And also glad you were cycling (even if not consciously) yesterday for ‘Moving Planet’ day… a day thousands worldwide dedicated to a low carbon future by cycling, walking etc see http://www.moving-planet.org – our event was ‘Moving the Midlands’. So far there’s been only a dusting of snow above 3000m, the aspens are *just* starting to go golden now, and it was 27°C yesterday, so the weather’s nice for the moment. But who knows what next week will bring! I’m sure you’ve no shortage of hospitality, but if you pass through Boulder and need a place to crash, let me know. Thanks for the kind offer Zane. I need to check a map and see where everything is, Boulder would certainly be great to visit. Fingers crossed for the weather. Great news! I’m sure it’ll be fine in Colorado, you’ll still be a week or two ahead of my schedule last year, and the weather was near perfect. Where will you kick off from? Steamboat is great – drop in to see Kent Ericksens framebuilding shop there and Orange Peel bikes around the corner. My favorite spot though was Salida, a great little town, fantastic trails on the hills around, its well worth staying there for a few days to explore – there is a really nice little mountain biking scene there. In fact, it would be a great spot to start the trip from, as you could re-acclimatise by exploring those hills. Salida sounds great, will definitely plan to linger there. The plan was to start in Steamboat, catching a shuttle from the airport. The guys in Orange Peel will point you to some great trails around there I’m sure. BTW, if your body needs tuning before you set off, i still have the card of a great physio in Steamboat, I was suffering bad back pains after Wyoming, he did an amazing job in twisting everything back into place. Salida is smaller and friendlier than Steamboat (cheaper too) – I was hoping to do the Monarch Crest singletrack route which everyone says is great, but its very high and was snowed out when I was there (end of October). But there are plenty of other great routes, some starting right from the center of town. Thanks for the messages of encouragement. They are much appreciated. Glad you’re doing well and able to continue your cycling through South America soon. I’m still in Argentina, so maybe our paths will cross when I travel back up through Chile, Bolivia, and Peru. Great to see you back on your path. If you find excess time in Denver, you could trade some stories for beer! good luck out there. a life well lived! Glad to see you hitting the road again. We have really enjoyed meeting other bicycle nomads between Alaska and Argentina and maybe our paths will cross someday soon. Excellent news! So glad to hear you’ll be back exploring South America. We’re headed to some of your old stomping grounds in Asia.